These ICF070 flange type Linear Motion drives are applicable for adjustment and positioning in a UHV system. Compatible to UHV conditions below 10-8 Pa (10-10 Torr) operating pressure. Non-leakage by the use of reliable edge welded bellows. Seven choices of strokes between 20 and 100mm. Travel for one revolution of the handle shaft is 1mm. 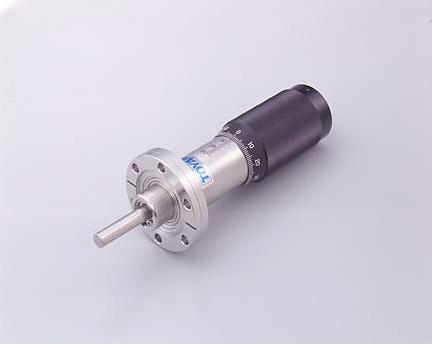 Precision positioning is available by smooth linear travel movements and high thrust loads. There is no rotation of the shaft during linear movement.